DANVILLE, CA SEPTEMBER 30, 2013 Jason Scherer finished the 2013 season with a Win at the 2013 Ultra4 Nitto Tires National Finals in Congress, Arizona. Jason started 12th, per the season points starting order, and finished first ahead of Nitto Tires teammate Rick Mooneyham by only 4 seconds. This season Jason Scherer has qualified for two pole position starts, won two events and has been plagued with transmission failures, a full season of roller coaster rides, according to Jason. “It’s hard to win these races with the level of talent in our field of drivers. You never know if this is going to be your last win so you really have to cherish them when you can. Winning the last race of the season always gives you a nice offseason and hopefully I can start the year off with a win next year and keep the momentum going,” said Jason Scherer in a post-race interview. This was the last race for the PSC Motorsports Ultra4 car driven by Jason Scherer. “The last two years have been a great partnership with Tom Allen and PSC Motorsports, however it has been decided to sell the car at the end of the 2013 season,” said Scherer. “Now it’s time to start the new car Myself, Rage 4th and Team Awesome have dreamed up to really take us to the next level!” Rubicon Express, Nitto Tires and many more of the teams existing sponsors will be involved in this new vehicle build. If your company would like to be included, please reach out. Redline Oil – Best oil you can run. Period. I would also like to add a Congratulations to The Campbell family on another hard earned Championship. To be the best you have to beat the best and they continue to prove it. Also a Thank you to fellow Nitto Teammate Rick Mooneyham for lending his Dad to our team and Congratulations on getting Nitto a 1-2 finish at the Nationals! Jason Scherer started on the pole position at the 2013 Griffin King of the Hammers presented by Nitto Tires and finished 21st with 25 minutes to go. Jason completed two entire laps of the race with no power steering, stating it was one of the most physically and mentally demanding races in his career. The Win at the MetalCloak NorCal Stampede, at Prairie City SVRA came with a lot of work. After placing first in his heat on Friday he could hear the front differential making a lot of noise and knew that in order to get through the main race, they would need to fix it, which took all night and we’re ready for the green flag of the main race just in the nick of time. The second pole position for the season came at the 4Wheel Parts Grand Prix race after having the fastest heat lap times, followed by leading every lap of the race until the transmission failed. 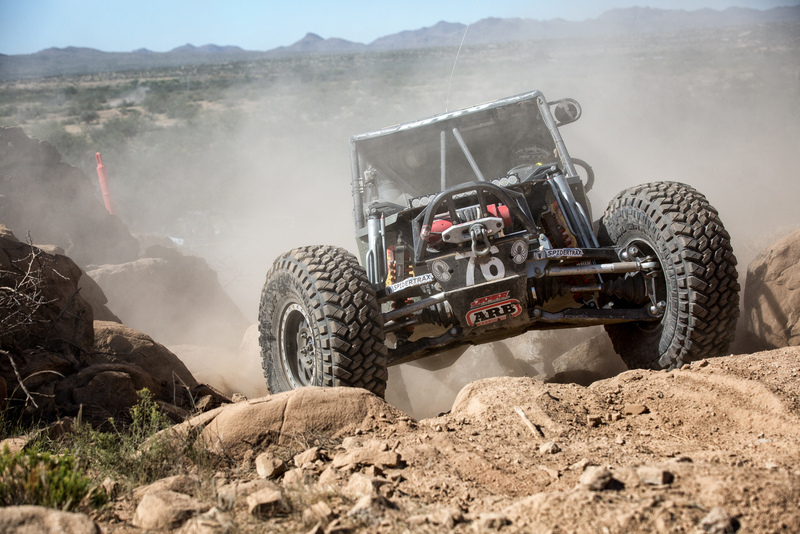 Jason started 12th at the Ultra4 Nitto National Championship based on his season points position. He had a consistent race to finish the season with his second Win in 2013!